Kropki Sudoku puzzles add extra constraints to regular Sudoku, labelling all pairs of neighbouring squares which contain values where one is either twice the other or has a numerical difference of 1. 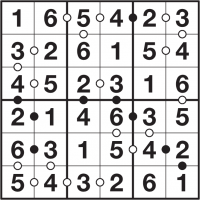 A Kropki Sudoku puzzle consists of a standard Sudoku grid with the addition of either black or white circular markers between neighbouring pairs of squares. Black circles show all adjacent pairs of squares where the value in one square is double the other, while white circles show all pairs where one value is consecutive to the other. 'Consecutive' means that the numbers in the two squares have a numerical difference of '1'. For example: 2 and 3 are consecutive, as are 6 and 5. So, to solve Kropki Sudoku you must place 1 to 9, or 1 to whatever the size of the puzzle is, once each into every row, column and bold-lined rectangle while also obeying the circular markers. What's really important to note is that all circular markers are given, so if there is no marker between two squares then they are not consecutive and one is not double the other. When 1 and 2 are in adjacent squares then either a white circle or a black circle will be given (since both are true). Look at the top row of the solved puzzle on the left. The 1 is neither consecutive to the 6 nor half of it so there is no circle between the 1 and 6. The 6, however, is consecutive to the 5 which is consecutive to the 4 so there are white circles. The 4 is double the 2, so there is a black circle between them. Every Kropki Sudoku puzzle only ever has one possible solution, and it can always be reached via reasonable logical deduction. In other words, guessing is never required. Kropki Sudoku puzzles on puzzlemix appear at a wide range of sizes and difficulties. Usually they are 6x6, 8x8 or 9x9, in which case you must place 1-6, 1-8 or 1-9 once each into every row, column and bold-lined rectangle. These bold-lined rectangles are 2x3 for 6x6 puzzles, 4x2 for 8x8 puzzles and they are 3x3 for 9x9 puzzles. Are you searching for help with Kropki Sudoku puzzles? Stuck on solving Kropki Sudoku? Don't know the instructions for Kropki Sudoku? Need Kropki Sudoku instructions? Want solving hints and tips for Kropki Sudoku? Then puzzlemix is the place for you to play Kropki Sudoku puzzles online. Looking for printed Kropki Sudoku puzzles? Visit Sudoku Xtra for puzzle magazines and books. Or are you looking for a Kropki Sudoku puzzle supplier? If so then check out Any Puzzle Media, my puzzle production company.